Bill Anton was born in Chicago in 1957, later moving to Prescott, Arizona and graduating from Northern Arizona University. 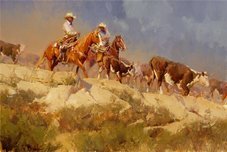 His work has been published in Southwest Art, Architectural Digest, Art of the West, Equine Images, Western Horseman, and Art-Talk. 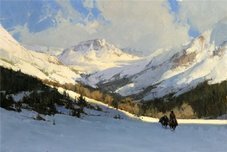 His pieces can be found in the corporate collections of Sears, Dupont, State Farm Insurance, Bank of America, Hewlett Packard, and Trust Company of the West. 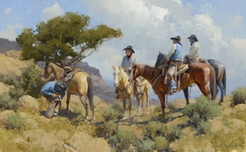 His award winning paintings have been featured in exhibitions--such as the Prix de West at the National Cowboy and Western Heritage Museum, and Masters of the American West at The Autry Museum--and his works have been displayed at The National Center for American Western Art, the Old West Museum, and The National Museum of Wildlife Art. 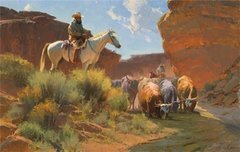 His artwork belongs in the permanent collection of the prestigious Gilcrease Museum. 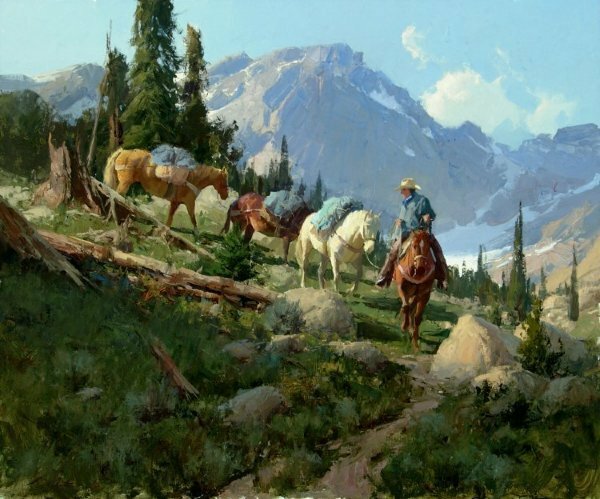 "I do not see myself as a biographer of the 'cowboy,'" the artist shares. 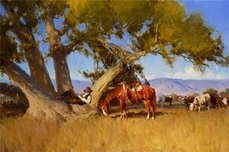 "I know some artists feel they are recording an historical portrayal of ranch life today in the American West. But the focus of my work has always been mood and passion. If I'm recording anything, I'm recording how I feel about the West. 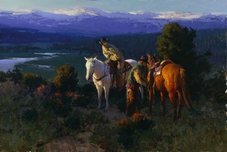 I want the viewer to feel the drama of atmosphere and the mystery of a western night. I want the volume and portent of a cloud to be evident in the calligraphy of a brush stroke. 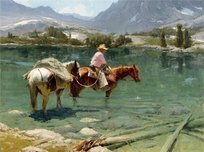 The pack of the muscle below a horse's shoulder should be energized by the gestural application of paint." Amidst this nobility is its caretaker: the rancher. With the natural ease of generations bred to the saddle, he is a powerful image, further ennobled by a fine horse. Bill Anton, an artist under the spell of the west, has the privilege of marshaling the virtues of landscape, figure, and equine painting into one supremely paintable subject: the American cowboy.